I did my first 8 minute mile. Wow! This is also the fastest I’ve ever completed 10 miles too. Today was my long run. 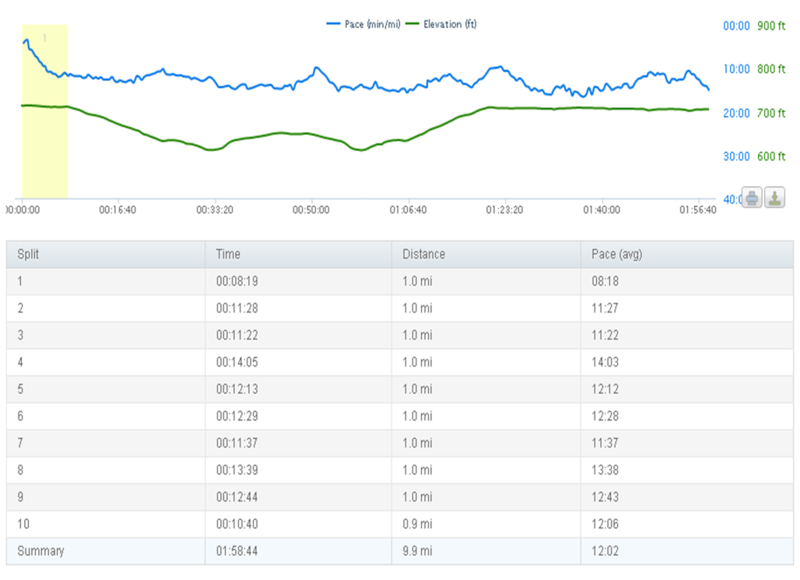 Marathon Training – back on track. Today’s mantras…never give up and acheive the impossible. I felt really good and could pick up pace with ease and not feel strain or exhaustion from such. I actually feel I could go out and run some more. The air was perfect and the temp – 60 degrees. My knees were sore into mile 8 and 9 but mile 10 I really poured it on for first half of the mile and then race walked the last. I took along a package of Gu (yuck). I think it helped me though. I read that the body absorbs that better than the energy beans while running. So will continue even though it isn’t very appealing. They should call it something else too. I’m going to rename it – “Power Pack“. I like that much better. So when I say “Power Pack, you know that is actually – Gu. Have an awesome day and here’s to everyone who is striving to achieve, what they maybe thought at one time to be …impossible. This entry was posted in Fitness, running, Video. Tagged Events, Gu, long run, Long run and short run, marathon training, Mile, Mile run, Power Pack, Running, Sports, Ultramarathon. Way to go Anne – great run! I did my 10 mile run today also. Looking forward to the marathon! Thanks Stephen – It was a perfect day too. Good luck with your training! I’ve been trying the GU too. I took some peanut butter on my Saturday run this week and was pleasantly surprised. I’ve tried the chocolate and vanilla. They weren’t horrible but I think the PB is the best of them all. I have a friend who literally will puke on the berry flavored GUs…..and yes, they definitely need to change that name! Congrats on the run. Saturday was my first 10 miles. I loved it but man did I hurt afterwards. Although, I do believe the post run stretching and carb intake helped me to a speedy recovery. It’s now Sunday afternoon and I’m almost fully recovered. Hi Sean – Hey thanks for your comment. I will definitely try the peanut butter. You are right about the recovery too. The post race refueling and stretches are critical. I’m 50 and the stretching has kept me virtually injury free (so far). I’ve finished 3 half’s and this is the first full. This is the first time I’ve run the full distance too. Congratulation’s on your run and stay in touch. When is your race? Way to go! That was unbelievable in the video too! Thanks! I think our perspective shifts when we truly believe anything is possible.